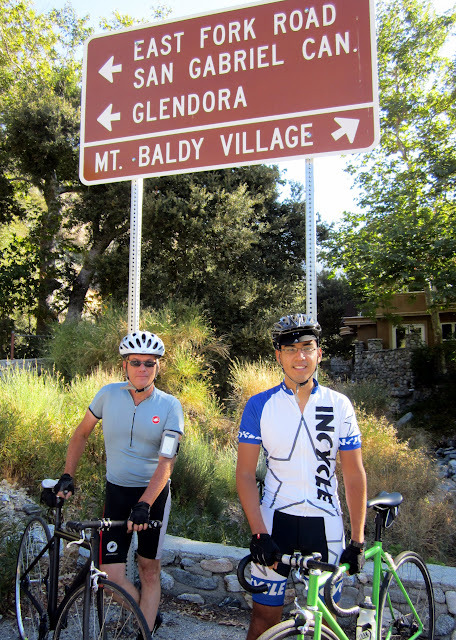 Today John and I road fixed gear up Glendora Mountain Road to Mt Baldy. I wasn't sure if GMR would be open due to this years Williams fire. We decided to meet at the gate and sure enough, GMR was open!!! Above is John riding up to the gate. I hung out right on the center line, for Michael at the CLR Effect. I snapped this photo and as John approached, I could hear the faint sound of Counting Crows. Counting Crow emanated from his iPhone. Good music and it was particularly loud so I asked if it was hooked up to an external speaker. It wasn't and I was very impressed with the sound. As we made our way up the mountain, John's iPhone rocked some classic tunes from; AC DC, Ted Nuggent, Aerosmith, etc, which made for some motivation to "keep on, keeping on!" The ride between Fork plus 5 thru 7 was brutal. Ted Nugget's, "Stanglehold," was playing as we made our way up this section. 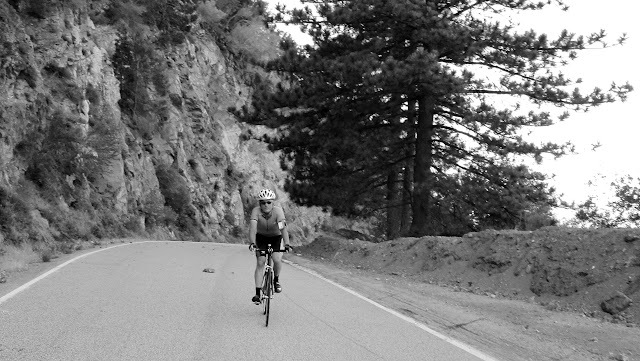 I was tired and knowing that the climb was almost over, kind of messed with my head. I tried to focus on Stranglehold's long instrumental riff to get me through Fork Plus 5 to 7. I was trying to focus on the music and match my cadence to the steady beat. Because of the Williams Fire, it has been a couple weeks since I made my way up GMR. 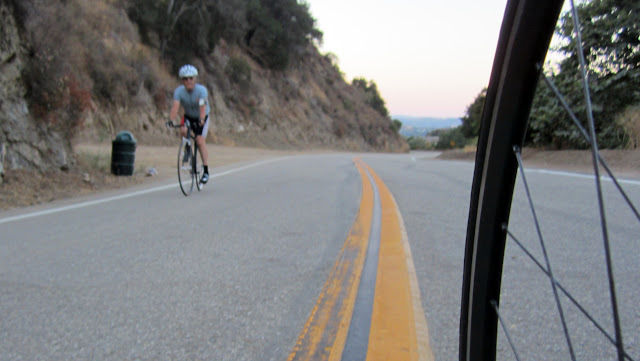 GMR is funny, because I cannot take too much time off this type of ride or it hurts coming back. Today was not that bad, just between Fork Plus 5 and 7. It was nice riding with John, his classic rock and his fixie. 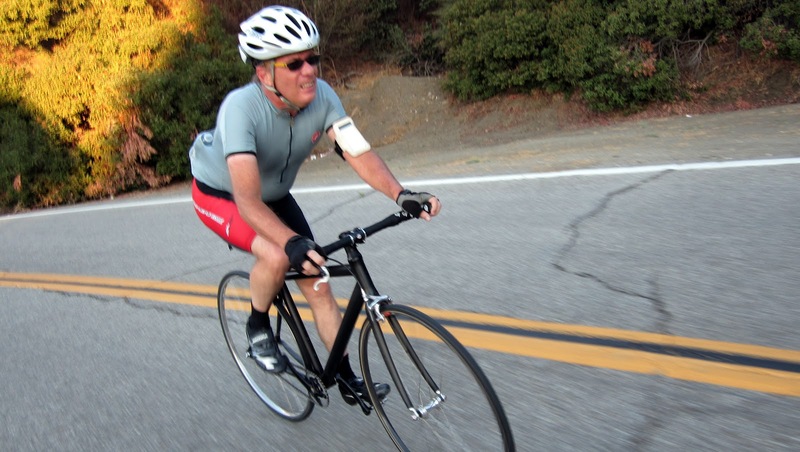 John's a strong rider and I am sure his years of rock climbing helped. 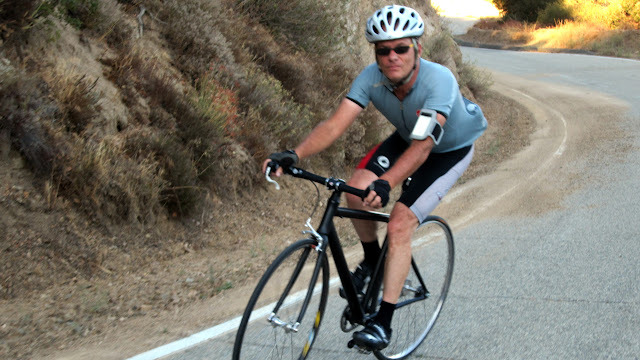 John, it was great riding with you. Lets keep riding and next year we should try for the lifts!